The Newfoundland Pony Conservancy Center can be selected by multiple online shopping organizations as your preferred charitable organization. Shop and save money on your purchases by taking advantage of coupons and unique specials that retailers offer for participating. Then those retailers donate to the Conservancy Center. It costs you nothing to help a cause, and it helps us buy hay for the ponies. ​Totally great, totally painless, totally FREE giving! ​AMAZON SMILE - We have an account with Amazon Smile. Please consider using Amazon Smile to make your own purchases on Amazon. A small percentage of sales is directed our way if you select us as your preferred charity. 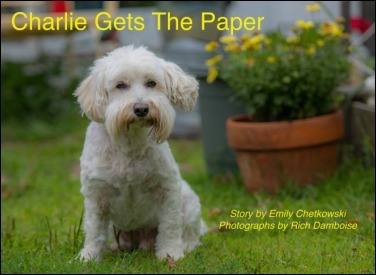 Check out our Sanctuary story, a downloadable Children's Book that tells all about the ponies through the eyes of sanctuary pup Charlie. Each $5 download buys 1 bale of hay that feeds 3 ponies for one day! Check back for future items, including the return of sold out Ammy Socks! Also, look for decals, mugs, bracelets and t-shirts (we try to keep things local, so we're looking for a shop in the Monadnock region).